...my cousin Jessica! She JUST recently started a blog and she has lots of treasures tucked away in her head! 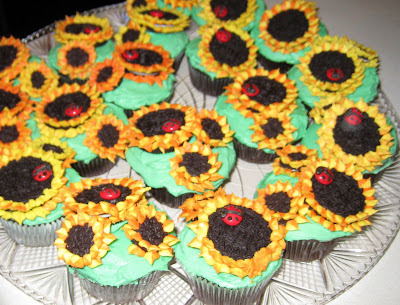 For example, look at these incredible cupcakes that she created! They look like they're from a magazine not her kitchen! You can visit her new blog HERE. But today, I wanted to share a Fall Project that she recently did. This isn't MY project...I don't sew! But I thought it was so adorable that I immediately asked her if I could share it here. -Sew your head piece and body/neck piece together leaving an opening in the head and one in the side of the body to stuff your scarecrow. -Put a produce bag in the bottom of the body and fill it with 2 lbs of pinto beans for weight. Tie it off with a twisty tie. -Then stuff the head and body and sew it up! - Cut eyes, nose, and mouth out of felt and hot glue them to the face. 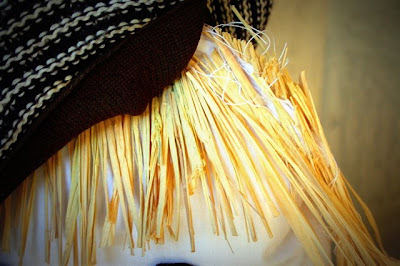 - Then, cut raffia for hair and hot glue in to the head in the shape desired. - Attach a hat over the hair with thread and a needle. - We dressed the scarecrow in 24 month old clothes that we found at goodwill. - Then cut more raffia for the hands and feet. 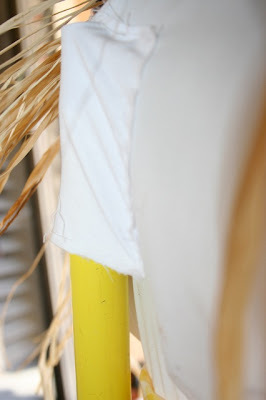 Take string and tie the raffia inside each limb with a bow. - On the back of his head cut a small rectangle and and sew it for a broom handle to fit into. 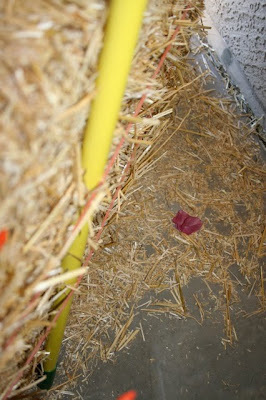 Then wedge the broom handle in the bale of hay sting and hang your little guy on the broom handle. - He will fold up for easily storage too! 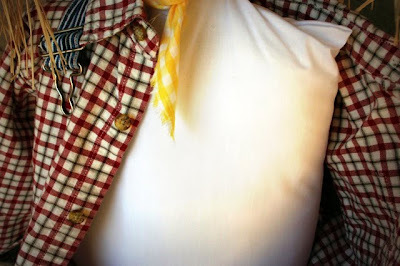 Try using BURLAP for your fabric, you'll have one stylish little Fall Scarecrow. What a perfect touch for your Autumn front porch! You'll want to squeeze him every time you walk by. 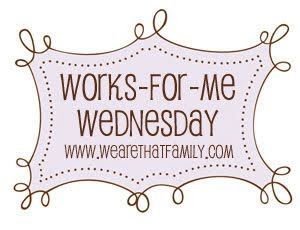 For More Works for Me Wednesday Ideas, Click on the button below! 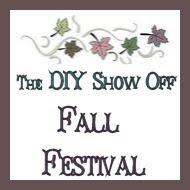 I am linking up to the FALL PARTY at DIY Showoff too! What a cute scarecrow...I always made one when my girls were little...can't wait to have grandkids so I can make some more! I will go check out your cousins blog now. So cute! I wish there was one that required zero sewing - I'd make one for both kids! How fun! I love those cupcakes. They look like they would be so hard to make. And that scarecrow is adorable! I will go check her out! how did the chicken/dumplings turn out? mine are going in the crock right NOW! Cute cupcakes. 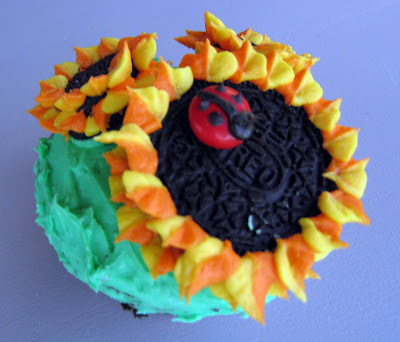 We just celebrated my littlest 1st birthday which was a ladybug theme. I wish I had seen these cupcakes a week ago....so cute and creative. Thanks for stopping by my blog. It is always fun to meet other homeschooling Moms. Blessings to you this school year!!! What an adorable scarecrow. Love that face! I can hand stitch but I have no idea how to thread the bobbin in my mom's old Sears sewing machine! I actually bought a little scarecrow at a garage sale in the summer! I'll have to post a picture of him! 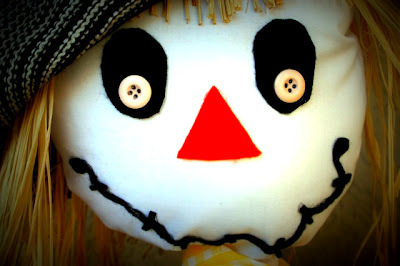 I have fond memories of making scarecrows when I was a little girl during Halloween. I should try making one with my son! That's one Martha Stewart-esque cousin you got there...cute cupcakes and scarecrow! Those cupcakes look amazing!! And yummy! Those cupcakes are one of the coolest things I have ever seen! Every woman in your family is very talented, huh? Good pictures of the scarecrow too. It looks like creativity and talent runs in the family!!! I'm lovin' your beadboard walls. Don't you just hate back orders!!! super cute, I don't sew either! I love it! My kids keep asking me to decorate for Fall and Halloween and I just can't seem to get to it. I love these ideas. Thanks for sharing! What a great scare crow, my kids would love him!! 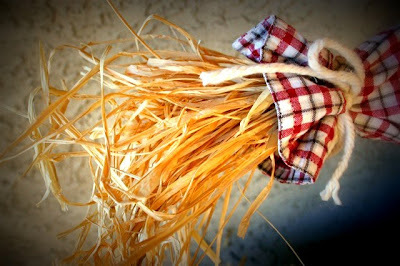 And the burlap is such a great idea...I love burlap! Thanks for sharing. Don't forget Friday is Frugalicious Friday! How stinkin' cute! I'll have to visit her blog, too. Those are like the cutest- yummiest cupcakes ever- and the scarecrow ain't bad either! I just love those cupcakes!!! Those are the cutest cupcakes I have ever seen. Your cousin is talanted. You guys must have craftiness in your genes! Love the scarecrow....Loved visiting your blog...Blog hopping is one of my favorite things to do. I love those cupcakes. She's very talented. Both the cupcakes and scarecrow are very cute! We made a scarecrow a couple of years ago without any sewing. I am trying to remember exactly how I did it but I remember using an old white t-shirt (child size) for the head and we tied the top together and then stuffed the head and drew a face on it, put a hat on top (which covered up a very funny shaped top of the head) and then tied the bottom of the head and tucked the rest of the t-shirt into the shirt as a neck. It wasn't as nice as the one pictured here but it was still very cute, easy and there was no sewing required.